We’d love your help. Let us know what’s wrong with this preview of The Folcroft Ghosts by Darcy Coates. Tara and her brother Kyle are sent to stay with their estranged grandparents when their mother is hospitalised. May and Peter Folcroft seem warm and charming at first, and the house, hidden in the base of the mountains, is idyllic. But strange things keep happening. The swing moves on its own. Peter paces around the house late at night. Doors slam and curtains shift when n Tara and her brother Kyle are sent to stay with their estranged grandparents when their mother is hospitalised. May and Peter Folcroft seem warm and charming at first, and the house, hidden in the base of the mountains, is idyllic. The swing moves on its own. Peter paces around the house late at night. Doors slam and curtains shift when no one is inside. Tara begins to suspect the old house is haunted. When a storm cuts the phone line, May shifts from doting to obsessive. Tara and Kyle must try to keep up the pretext of a happy family, but an empty journal and locked room provide clues to the unforgivable lies, secrets and decades-old murders entwined with the Folcrofts' history. To ask other readers questions about The Folcroft Ghosts, please sign up. THE FOLCROFT GHOSTS, by Darcy Coates, was one of her novels in which I developed a strong attachment to the characters very early on in the tale. Two children, Kyle (11) and Tara (15), find themselves completely uprooted when they are taken to live with their mother's parents--whom they've NEVER met--after a sudden car accident puts their mother in a coma. ". . .a fantasy world was easier to cope with than their new reality." Grandma May and Grandpa Peter greeted them with so much affection, the THE FOLCROFT GHOSTS, by Darcy Coates, was one of her novels in which I developed a strong attachment to the characters very early on in the tale. Two children, Kyle (11) and Tara (15), find themselves completely uprooted when they are taken to live with their mother's parents--whom they've NEVER met--after a sudden car accident puts their mother in a coma. Grandma May and Grandpa Peter greeted them with so much affection, the two had to question why was it that their Mom never took them to visit. When they saw the large old home beautifully secluded in the woods, they couldn't help feeling drawn to it, especially compared to the series of cramped apartments they'd always inhabited. ". . . Family has always been important to us Folcrafts." Coates really has a way with characterization--especially when it comes to children. At just a quarter of the way through, I felt I had known Tara and Kyle for years. Tara was used to taking care of her brother, and much like the Folcrofts, had a strong love for her family. Kyle was the bookworm; outwardly timid, but with a mind that knew no boundaries. ". . . what does it matter if I forget a story after a month as long as I enjoy it while I'm reading it?" The dynamics of the personalities in this book were incredibly complex and spell-binding, I felt. This was especially impressive in regards to the children. ". . . It's like he doesn't want to live in the real world anymore . . . "
With only a few chapters, Coates managed to convey more about the two kids' feelings, upbringing, and loyalties than some writers pull off within an entire novel. When things start to . . . alter . . . the reactions shown are plausible here, even in what would be an implausible situation, otherwise. ". . . If this is true, it's really, really bad . . . "
The isolated, large home, is somehow made more "normal" by virtue of its position in the deep forest, outside of the passing of time that the rest of the village has kept up with. It's so easy to believe that in a remote location, anything could be considered commonplace when it's all you've known. Coates plays up the atmosphere very convincingly. "Death is not a blessing . . . "
Overall, this was a novel that really took me by surprise with the overall direction it took--in a good way. I was so entranced by the emotional upheaval that the kids were going through, that certain other occurrences really hit forcefully, making me pause to take things in from different directions. As a voracious reader who is "seldom" very surprised by anything in a novel, this was quite a pleasant change. There were several twists that I had never even guessed at. I have to give Darcy Coates credit for taking on what could have been a common, run-of-the-mill story, and elevating it to something much more unique. ". . . If fiction has taught me anything, nothing's a coincidence." Darcy Coates is quickly becoming the author I turn to when I'm wanting a pleasant distraction. The Folcroft Ghosts has a strong The Visit feel to it for the longest time, but there's a twist in the end you wouldn't be expecting. Perhaps a full review later. This was a really good book! I read it in a day and a half! Kept my attention and kept me glued to my kindle! The story is about two teens that go to live with their grandparents while their mother is recuperating in the hospital. The grandparents are a doting elderly couple who want nothing more then the best for their grandchildren...or so it seems. Also the house they live in is supposedly haunted. The story just reaches in and pulls you into the house with the teens. Darcy Coates Great Read! The grandparents are a doting elderly couple who want nothing more then the best for their grandchildren...or so it seems. Also the house they live in is supposedly haunted. The story just reaches in and pulls you into the house with the teens. Darcy Coates grabs the reader from the first page and she doesn't let the reader go until the last page. Fifteen-year-old Tara Kendall and her eleven-year-old brother, Kyle are taken to their maternal grandparents' house after their mother is in involved in a car accident and slips into a coma. They have never met their grandparents and are reluctant to stay in their remote home, but Peter and May Folcroft are graciously accommodating and seem genuinely concerned for their grandchildren. They lavish them with gifts and more food than they can eat. They spend quality time with them and play family g Fifteen-year-old Tara Kendall and her eleven-year-old brother, Kyle are taken to their maternal grandparents' house after their mother is in involved in a car accident and slips into a coma. They have never met their grandparents and are reluctant to stay in their remote home, but Peter and May Folcroft are graciously accommodating and seem genuinely concerned for their grandchildren. They lavish them with gifts and more food than they can eat. They spend quality time with them and play family games together. But Kyle can't help but feel that something is off. Soon Tara also grows suspicious. Do the kind-hearted Folcrofts have an ulterior motive and sinister plans for them? This book reminded me of those great R.L. Stine stories for kids. It is well-written and entertaining. The characters are realistic, relatable and likable. The story is well paced and easy to follow. It's a simple story, straightforward and quick to read. As there is little violence and no gore or foul language, this book is definitely suitable for young adults. It was a tad too tame for my taste, though, and is the only reason I'm withholding that fifth star--just my preference. I was hoping for something scarier. I was pretty surprised by the ending. I really enjoyed the premise for this story. Two teenagers whose mother is in a coma following an accident are sent to live with their grandparents while she is (hopefully) recovering. They have never met these grandparents, they live in a very old house in the middle of nowhere. While their newly found grandparents are nothing but sweet to them, something still feels amiss. Is there more than meets the eye or just two confused teenagers? I really liked how I was pretty surprised by the ending. I really enjoyed the premise for this story. I really liked how it was an innocent situation and you are unsure if something is going on or they are just scared because of their circumstances. Yet another amazing book by Darcy Coates. The ghosts are just perfect. Good writing, nice characters, decent atmosphere. I just wish it was more... spooky. For a book with the word 'ghost' in the title, I think in the end I found the people more disturbing than the ghosts. Probably deserves a better rating, to be honest, but I'm a bit bitter that this wasn't as horrifying as I wanted it to be. I'd recommend this to anybody looking for a quick read with minor spookiness. I love a good ghost story, so when I saw this come across my bookbub feed (BB knows my weaknesses( I jumped on it. While I usually avoid YA at all costs, I love a good ghost story more. This one was really good, more creepy than scary. Luckily, thanks to evil BB's ways, I have another DC all ready to go when I am wanting a new ghost story to read. First book of 2018! Pretty good book, held my interest.. wasn't expecting the twist at the end. It did drag a bit in the middle found my self just skimming more than actually reading but it picked back up towards the end. After reading the preview of the book, I was hooked and for good reason. This was a seriously chilling and very compelling read! I really think this should be made into a movie. The characters were believable and the kids reminded me of my sibling and I. I recommend this to anyone who needs a spooky book to read!! This was a fun read with just enough creepiness to keep me interested. Definitely a timely novel! I am interested in reading more from this author. A pretty great book with lots of twists and turns. So I have been meaning to read this one, but couldn't find it, then I found the audio book, and while I don't like audio books (it is just so slow, I can read the same book in +/- 2 hours while they take 5 to 6 hours for it), I just had to get this one. I do have to reduce one star from the total for the audio book/narrator. The narrator just didn't fit, and I was plenty of bored. I even noticed that I was falling asleep at times. She was just re A pretty great book with lots of twists and turns. I do have to reduce one star from the total for the audio book/narrator. The narrator just didn't fit, and I was plenty of bored. I even noticed that I was falling asleep at times. She was just reading it all too monotonous. I even let my boyfriend hear the audio as he was curious, and he agreed with me, also saying she was exaggerating several things (to which I agreed back). The narrator being hit or miss is also another reason why I tend to stay away from audio books. You just have to be lucky and have a good narrator, or else the book is definitely less fun. Now for the book. It was pretty great, it was a bit slow in the beginning, but when stuff started to get a bit more interesting it stayed interesting and fun. I just needed to know more. What happened to the mom? Was it an accident, or was it more? How did the grandparents know about the accident and the kids needing a home? What is up with all the spooky stuff happening around the place? Will the kids get out safely? Why was the mom so adamant on getting away from her parents? What is up with the house? I had so many questions, and all of them got answered and it was truly a ride to remember. Also something that I didn't expect was the fact this was YA-ish. Since this is Darcy Coates I was expecting an adult horror book. So it took me a bit to get into the story as it was quite different from her other books. Still the same writing, but different age group and that is quite noticeable. In the end it turned out to be quite a good YA, but I think I much prefer her adult horror stuff over this. Our MC was Tara, and I have to say I didn't like her for most of the book. She was a sweet girl in the end, but the way she was treating her brother, how she kept dismissing his love for books, how rude she was about reading in general. Then there were several other things that I didn't like about her. She did get better in the long run, but yeah, there were several times that I just wanted to pause the audio book and not go back. Later on I saw a sweet girl and a great sister who would do anything to help her little brother out. She was hard at work to get them out safely, to find the answers, and to keep them alive. There were several scarier parts in the book, the author definitely knows how to write atmospheric horror parts that will give you goosebumps and will have you look around you to see if anything scary is lurking nearby. The ghosts often weren't the only creepy thing going on. Mae (May) and Peter were also going for the first place in spookiness. The way they acted, the way they did stuff, the secrecy. The ghosts were creepy, at least at first, after reading the book I saw a totally different side to them and actually felt sorry for them. As the book continues we find out more about the Folcroft family, about the mom, about what happened at the house. About a certain event that happened 5 years ago. About a diary and what is in there. The book really keeps you on your toes, even when you think you know what happens it will throw something else in your face and startle you. Even me, near the end, was quite surprised with what happened there. I love a book that keeps you thinking, that keeps you on your toes, and that loves throwing well written twists and turns. The ending was terrific, though I had wished that a certain thing was done and said. Now it felt a bit incomplete. Maybe an epilogue would have been nice. But all in all a book that creeped me out, that gave me plenty of goosebumps, a book I hope to re-read one day again, but this time on my own. Darcy Coates never fails to fascinate me!! She has become my destination when I am in a mood for horror. Fifteen-year-old Tara Kendall and her brother Kyle were taken to their grandparents' home after their mom is being involved in an accident. Tara and Kyle, who have never met their grandparents before try to settle into the Folcrofts family until their mother recovers. One day Tara happens to capture a glimpse of a spirit in her picture and her dubiety towards the house grows stronger. As the Darcy Coates never fails to fascinate me!! She has become my destination when I am in a mood for horror. i love the cover. i am usually a person to be more out to read it over watching a creepy movie. at least you can close a book cover ... if you get to freaked out!! such suspense, mystery and some thriller there too. i don't read this genre often ...but when i do ... i know i will always come back ...but not often ... u know ... hope that make sense ... it is a genre i do some ... but not on the daily ... must read ... if u love this genre ... take it in. I got this book on kindle unlimited for "free" as a secondary read to my books. I always like to have a book on my kindle aswell as reading a physical book (about something else) but this book became my priority read. It hooked me in and i couldn't stop reading until it was over. Nice work Darcy Coates. Can't wait to read more from you . I really enjoyed this book. I liked the characters, the setting, the plot...you name it. It had a real old-school feel to it, with gradual tension building throughout to a spooky culmination. Definitely a favorite! Suspenseful ghost story, full of twists and turns. I had one issue with the ending, but not enough to dislike the book. Fine for middle grade and up, I think there were a couple of minor swears. A fun read. Wow! It was not the ending I was expecting, so many twists and turns. It did not head in the direction I thought it would. The author has an amazing way of telling such a spine chilling story without giving anything away! As always, Darcy Coates delivers a great story with lovely characters. I especially loved the way the tension rose throughout the whole novel and the final twist. In order to do this I've been spending a lot of time perusing my previously read books and seeing what else the authors have published/do I own any of their other books? One author I noticed I read a couple books by & owned a bunch more was Darcy Coates. SO I've decided to read em all! This book was deliciously creepy. I got such strong 'The Visit' vibes while reading it. I LOVE a good horror movie - its legitimately my favorite genre of movie - and I had really liked The Visit when it came out. So when I read the premise for this story - grandparents the kids have never met, secluded house, general creepiness - I knew I NEEDED to read it. And let me just say, it did not disappoint. This is the third Darcy Coates novel that I have read, and I enjoyed every minute of it. As with any good ghost story, clues that help the characters (and readers) figure out what was going on were dropped at a pace that kept me interested, while not giving so much away that I got bored. The tension built brilliantly, leading up to the final confrontation. The setting was successful in providing me with a feeling of claustrophobia, as the characters were cut off from the world. I found myself wa This is the third Darcy Coates novel that I have read, and I enjoyed every minute of it. As with any good ghost story, clues that help the characters (and readers) figure out what was going on were dropped at a pace that kept me interested, while not giving so much away that I got bored. The tension built brilliantly, leading up to the final confrontation. The setting was successful in providing me with a feeling of claustrophobia, as the characters were cut off from the world. I found myself wanting to explore the house for myself, but was ultimately satisfied with how much of it we got to know in the novel. The characters themselves were interesting. May and Peter had a strangeness about them from the beginning, that Tara and Kyle, the characters we follow in the book, pick up on as they meet them. I did find the way that Tara and Kyle spoke to be a little bit off for their ages of 15 and 11, but that was barely enough of a distraction to warrant much attention. They were likable and relatively easy to relate to, and I found myself rooting for them. Writing them so young amped up my concern for them, as I wondered how they could possibly overcome everything that occurs.The descriptions of the characters, and ghosts, were detailed enough that it was easy to imagine their actions in my mind. 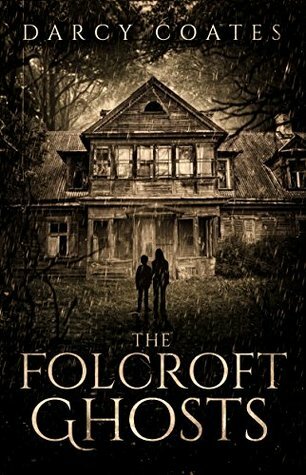 I can’t say too much else without spoiling the novel, but if you like unraveling ghost stories and mysteries, and if you’ve already read and enjoyed a Darcy Coates novel, then I really recommend the Folcroft Ghosts for a quick, fun read. I’m not sure I can say how scary this novel is, as I do not get scared as I play/watch/read horror, but if you are like me, I think there is still enough to make this horror novel worth a read. And if you do get scared? Let me know if this book is successful in scaring you! So. I enjoyed the concept behind this one. The idea of the haunting was great, but I wish we'd seen more of the household ghosts throughout the story. I think making this a bit longer and including more detail, more mystery, would have been a good thing. I wanted more of the ghosts. Tara annoyed me a little bit, while I quite liked Kyle's character. May and Peter were great characters, but I wanted more from the backstory and consequent events - nothing really scared me about this one. I was int So. I enjoyed the concept behind this one. The idea of the haunting was great, but I wish we'd seen more of the household ghosts throughout the story. I think making this a bit longer and including more detail, more mystery, would have been a good thing. I wanted more of the ghosts. Tara annoyed me a little bit, while I quite liked Kyle's character. May and Peter were great characters, but I wanted more from the backstory and consequent events - nothing really scared me about this one. I was intrigued, and entertained enough to comfortably finish the short read, but the climax...wasn't climactic. At all. So while the haunting and threat itself were interesting and creative, and I quite liked the idea of them, the stakes felt muted and the climax just...scrambled around uncertainly, rather than confidently whacking you in the face. I wanted to be whacked in the face, like with Ashburn House, The Carrow Haunt and Craven Manor. Darcy is the USA Today Bestselling author of Hunted, The Haunting of Ashburn House, Craven Manor, and more than a dozen horror and suspense titles. She lives on the Central Coast of Australia with her family, cats, and a garden full of herbs and vegetables. Darcy loves forests, especially old-growth forests where the trees dwarf anyone who steps between them. Wherever she lives, she tries to have a Darcy is the USA Today Bestselling author of Hunted, The Haunting of Ashburn House, Craven Manor, and more than a dozen horror and suspense titles. Darcy loves forests, especially old-growth forests where the trees dwarf anyone who steps between them. Wherever she lives, she tries to have a mountain range close by.